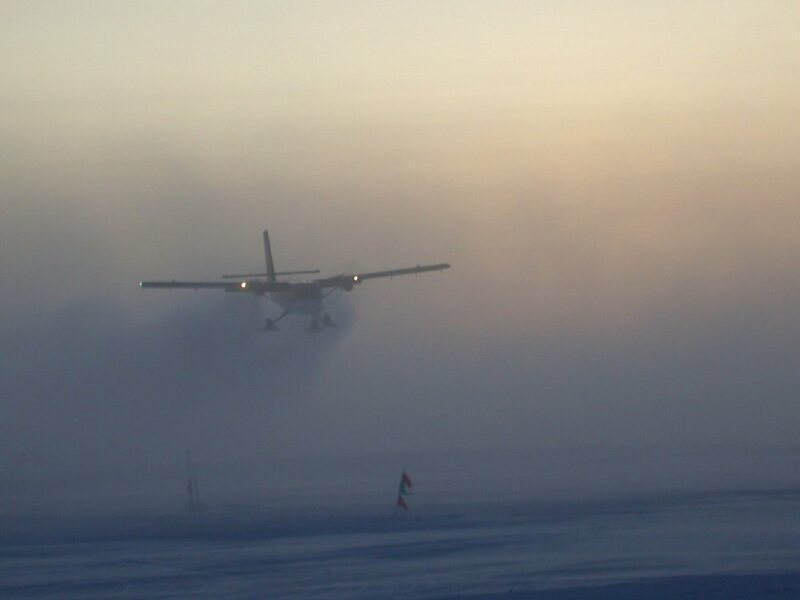 A Twin Otter lands at the National Science Foundation's Amundsen-Scott South Pole Station to evacuate a sick worker. 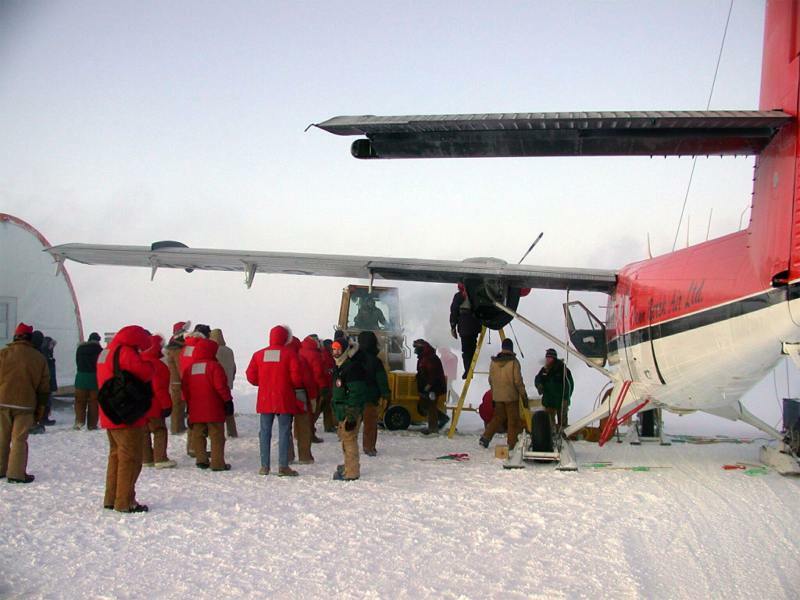 The plane was greeted by the community of 58 scientists and others at the Pole who had awaited its arrival through a weeklong period of bad weather. It was the first aircraft to arrive since February. The South Pole ground crew and Twin Otter flight crew warm the plane prior to refueling it for the return flight to the British Antarctic Survey's Rothera Station. A successful mission! The patient, 51-year-old Barry McCue, came forward on 10/1/03 to tell his story after successful gall bladder surgery 9/25. Barry was at that time recovering in Chicago. The story began on 8/25 when Barry, the safety/environmental specialist (his identity was not revealed at his request until after the surgery) had a stomach ache after lunch and reported to biomed about 4 PM. At the time it was thought he would remain stable until opening flight, but after a second attack on 9/5 brought further complications, Dr. Will Silva worked with telemedicine contacts before he and RPSC medical director Ronald Shemenski determined that an evacuation was advisable. it was time to get him out. He was stable, up and about, but his condition could turn for the worse at any time. Barry asked Will to remove his gall blader at Pole, but the surgery was deemed much too complex for biomed with only 1 physician and one physician's assistant. So, two Twin Otters from Kenn Borek Air left their home base Calgary 9/8 and 9/9, and the decision was made Friday 9/12 to go in (flight plan is at left). The 2 Twin Otters from Kenn Borek Air out of Calgary headed south, the first arrived at Punta Arenas on Friday 9/12 and Rothera the next day. The second backup aircraft arrived at Rothera a day later. The station made preparations . 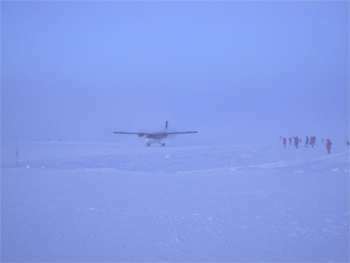 The flight to Pole was delayed until Saturday 9/20 due to blowing snow conditions at both Rothera and Pole. 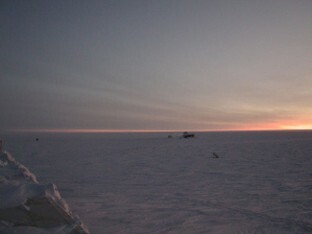 At right is a view of the Pole skiway from a few days before the flight. One of the pilots, Sean Loutitt, flew to Pole in April 2001 in -90°F darkness on the first such Twin Otter mission to evacuate...Dr. Ronald Shemenski. As an alternate return option, a RNZAF C-130 had been on standby to fly to McMurdo and carry the patient to New Zealand. The rescue flight left Rothera at 0048 Pole time Sunday 9/21 (8:48 AM EDT Saturday) and arrived at Pole at 0913 Sunday (5:13 PM EDT Saturday). The mission departed Pole with Barry at about 2100 (SP time, 0900Z or 5 AM EDT) after a 12-hour layover. This was the day before official sunrise, although skies were overcast. At landing the wind was from the northeast at about 11 knots, temperature -67°F. The flight from Pole arrived at Rothera at 1751Z (1:51 PM EDT) Sunday 9/21. The patient changed planes and departed on a flight to Punta Arenas at 1913Z (3:13 PM EDT). The flight arrived at PA at 0230Z Monday 9/22 (10:30 PM EDT Sunday) where he was observed leaving the aircraft and heading for a hotel. Barry may have visited a local hospital Monday before leaving for Houston at about 9 AM (EDT) on a Lear jet chartered from a Chilean ambulance service. 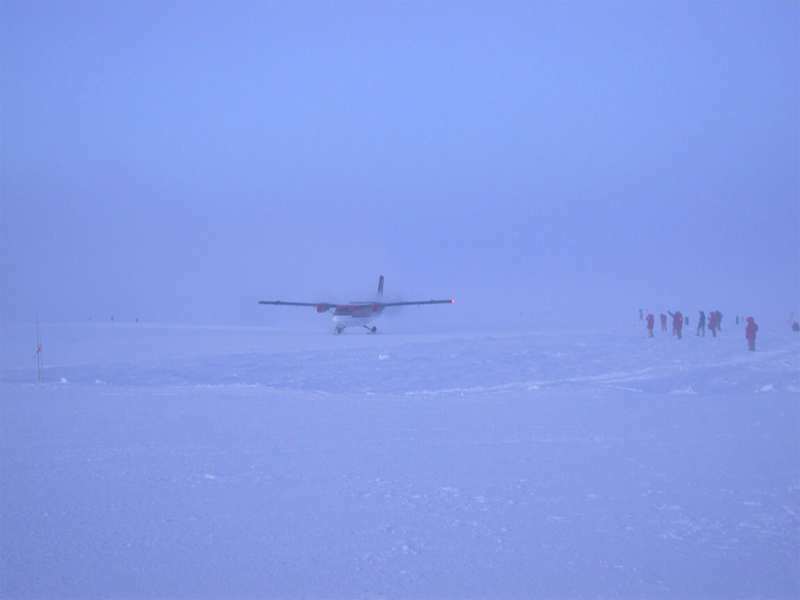 The Twin Otter evacuation aircraft parked on the South Pole skiway while the flight crew rested. The new, elevated station that NSF is building at the South Pole is in the background at left. 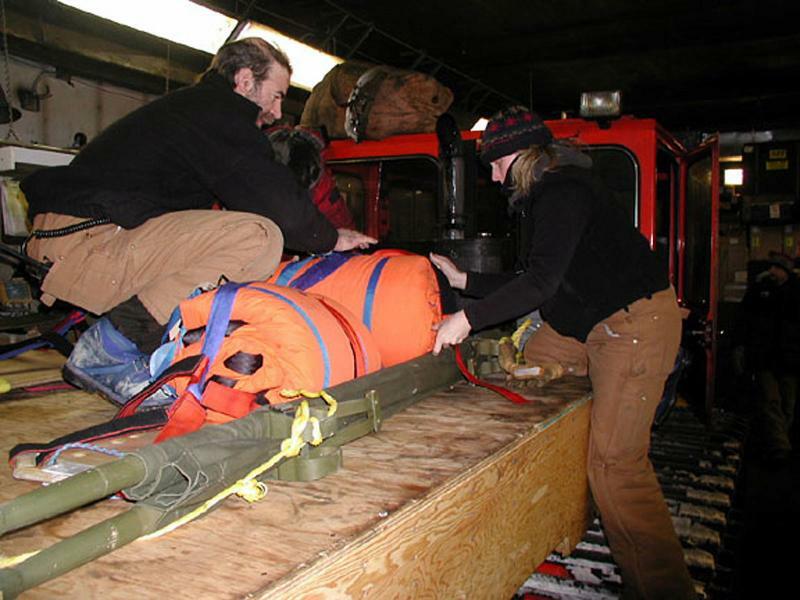 In the old garage, Dr. Will Silva (left), South Pole station physician, and Loreen Lock, of the National Oceanic and Atmospheric Administration who is spending the winter at the Pole, secure medical equipment to a vehicle. first winter medevac in April 2001.